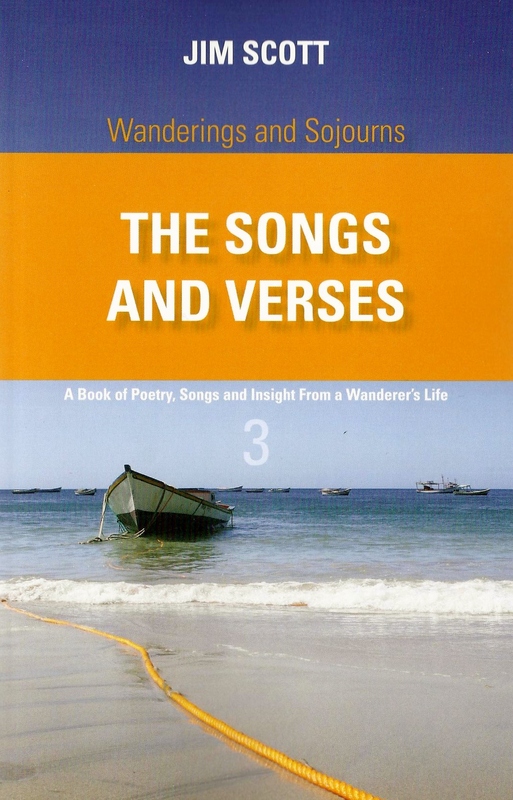 This, the third book in the series, contains 80 works of original poetry. Written in a more classical style of metrical verse not so prevalent in today’s world of haiku, free verse, rap and performance poetry, Jim holds fast to the rhymes and meters he came to love as a child. 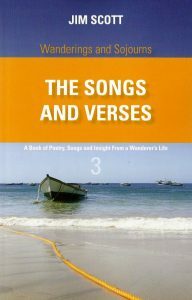 Some are written as if they were lyrics to a well constructed song while others explore the disparate and limitless variations of rhyming patterns and stanza form that allows each piece to be unique. As with all the books in the series this one covers a great variety of themes from bare-knuckle sailor’s yarns through songs of love and loss to tales of far off lands, philosophical reflections and encounters with nature. Available at selected book stores; on-line from Friesen Press, Amazon, Chapters, Indigo, Barnes and Noble and in Kindle, Kobo, Nook, etc. What readers have said about the book. Almost every poem had already been written, so the process of creating the book consisted mostly of editing and layup and other ancillary tasks. The book itself was pretty much written before I started. This is why although it is book three in the series, it was the first to be published. Each one is different. The one’s I like best seem to write themselves and happen very quickly, as if they were waiting somewhere to be put onto paper. But even so, a poem, like many works of written art, is never truly finished. The writer sees “tweakages” every time he reads it and has to exercise discipline not to keep making changes. Others I start seem to be going nowhere, so I put them in an “under construction” file and sometimes, years later, I see the way forward to their completion. From where does the inspiration come for the poems? Anywhere and everywhere. From people-watching, traveling to different cultures, experiences within the natural realm, from just my own philosophizing. There is little that at some level cannot inspire the writer, especially the poet for of all the genres it is theirs that has the most leeway to embellish and be fanciful. When I first went deep sea as an apprentice. I found reading and writing helped pass the non-working time productively on the long hauls between ports and that creative writing helped me stay alert during the 4 hour night-time watches on the bridge. After I left the merchant navy I just kept on writing and have been doing so ever since. Is there one special poem you’ve written that stands apart from the others in your mind? No. That is to say not just one but many. Poetry is such a mood driven art form that you not only have to be in a certain mindset to write a particular poem, you must also be in a certain mindset to appreciate it fully when reading it. Depending on where I am within my own head on any given day then anyone of a number of poems might resonate with me the most. I cannot say this one, or that one is my favourite unless you were asking me which one was at that particular moment. Will there be more books in the series and, if so, how many? Book 2 “On Tropical Islands and Sparkling Seas”, mostly stories and poems about sailing and my Caribbean years, is almost ready, and I have started mapping out book 4 which will be focused on my years and travels in the Iberian Peninsula. After that …… well, there’s still many more parts of the world, experiences and adventures about which to write, and many more yet to be lived. Why do you choose classical style as your poetic discipline? Probably because it is just that, a discipline. It has structure, it has shape which is both functional and aesthetic. I need form to keep me on track. When writing I need such discipline to prevent me wandering all over the map, to keep me on topic and in focus. But above all because when you nail a really good work of metrical verse there is a unique beauty to it that cannot be found in other poetic forms. I believe that traditional poetry, if well written, can do what the other forms can do, and then some. Why do you think traditional, classical style poetry is not as widely written or read as it once was? Because it is not easy to do well and takes many years to develop the art. In today’s world I’m afraid there is too much emphasis on fast return and not enough on long term investment. Classical verse, like classical music, cannot be written well without there being great investment in time developing the skills. Many people today, and I am guilty of this in many other areas, are just not prepared to devote the time needed to do things well with the result that although the product might be finished quickly, it is of poor quality. When that standard of product is offered it is respected by neither readers or publishers and it disparages all other of that ilk. Where the interest of the readership diminishes so follows the interest of the market with the result that most publishers, agents and, sadly, many schools are no longer supporting classical poetry. It’s a bit of a downward spiral that can only be reversed by offering a higher consistent standard or work and that can only be support by the industry and educational facilities which are currently not very interested. This is why I have self published for I saw no other way to get my work out there. Are there more books in the pipe-line beyond this series? There is a large environmental novel that incorporates some ancient Anishinaabe prophecies that is already written but awaiting some serious editing and re-write. I might be blowing the dust off that one when this series is finished. I am also looking at coffee table publications of poetry and pictures in collaboration with a couple of excellent photographers combining some of their photos with my verses, and I have the first in a series of environmental children’s books already complete just waiting for a publisher.